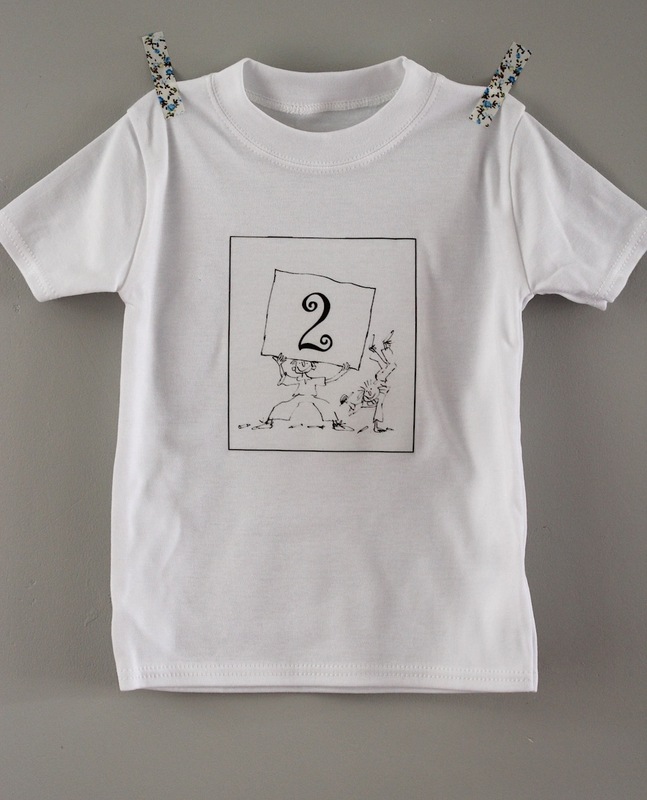 The sproglet turned two at the weekend and I couldn’t resist making him a birthday T-shirt. We had a brilliant party in the local park, with a gazebo bedecked with bunting. I felt I was fulfilling my SE London parental duties correctly. (If you walk through Peckham Rye Park on any weekend day in the summer, all you see are children’s parties, the park festooned with bunting, gazebos and balloons. I once even saw someone erecting a bell tent in the arboretum for the afternoon. The sprog wore his T-shirt all day long, spilling not one little drop of drink or cake on it all day. 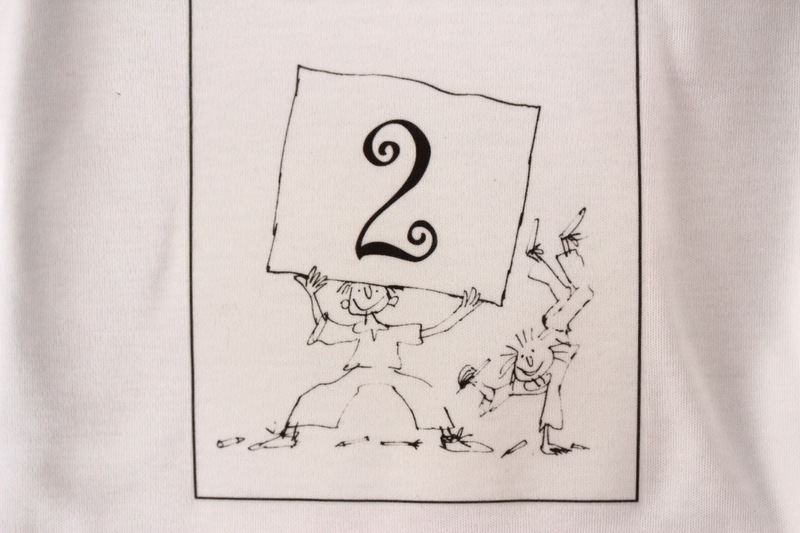 I thought he might recognise the number 2 on the front, but he didn’t really. But all the grown-ups complimented him on the lovely Quentin Blake drawings. Who doesn’t love Quentin Blake? I made the image using one of the free colouring in templates on the Quentin Blake website. I used the central part of the image, put it into a simple black square frame and then just stuck in a giant number 2 into the blank space in the font Curlz MT. I thought about writing “2 today” but decided that rather limited the usage (or at least gave the wrong impression for any other day) so I just stuck with a simple 2. Copyright of the Quentin Blake picture is obviously Quentin Blake’s, and these can’t be used for commercial purposes. See more on his copyright on his original colouring-in sheet. I think I’m going to make this an annual tradition; a new t-shirt every year. Who needs balloons when your Mom makes these special shirts? Thanks for the info about the Quentin Blake pages. As a former children’s librarian, I love most all illustrators. It’s a lovely t-shirt, thanks for the links to some images, I can use them with my monster. Thanks all for a bunch of lovely comments… I am a little bit addicted to making kids’ t-shirts, I think, but it’s so very easy and looks so nice! The sprog has little interest in what he’s wearing however, so we’ll have to see how long it is before he is insisting I only make him clothes with pictures of some Disney character on the front instead!